At Impact Trophies & Medals, we offer a huge selection of glass trophies suited to any martial arts event or club presentation. Included in our extensive range are glass star awards, plaques and crystal trophies for martial artists. 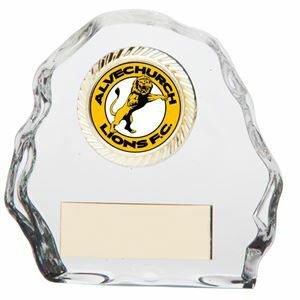 Impact Trophies & Medals are a leading retailer of glass trophies for martial arts, Whatever the occasion, many of our glass trophies and plaques can be personalised with high quality text and logo engraving or printed logo inserts, making each trophy perfect for your individual presentations and martial arts achievements. Excellent value. 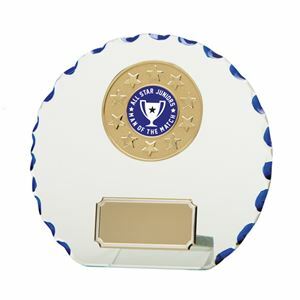 Cut from flawless superior quality 4mm thick jade toned clear glass, the Crest Jade Glass Award is a crystal plaque with bevelled edges and is held up by a small metal pin at the base. A logo or text message can be diamond etched onto this glass plaque making it perfect for any occasion. Available in a choice of 5 sizes. 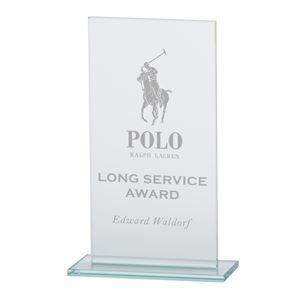 The Crest Jade Glass Award can be purchased with or without personalised high quality engraving. The Virtue Glass Award is a premiun 5mm thick clear glass plaque trophy. available in 3 sizes, the Virtue Glass Award holds a gold laurel wreath with space for a logo insert. The edge of the glass is cut with curved detailing for a premium finish. 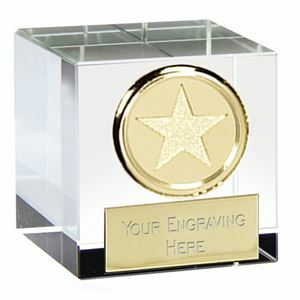 The Merit Optical Crystal Gold Award is a high quality glass cube with golden star centre. 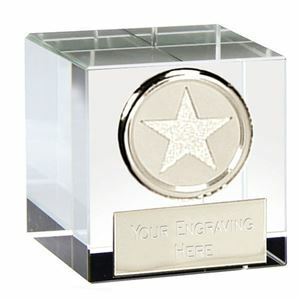 The star centre can be covered with an optional logo or image insert, whilst the bottom of the glass cube holds an engraved plate. The Merit Optical Crystal Silver Award is a premium quality optical crystal cube with silver centrepiece. 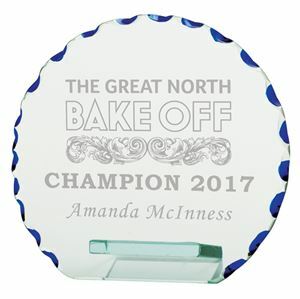 This premium quality award features a star etched silver circle, with the option to add a logo insert within the silver frame, as well as a silver engraved text plate, for that added personal touch. The Japan Clear Glass Award is a high quality clear glass award of 5mm thick. The blasted edge award features a sand blasted laurel wreath engraving around the space for logo insert. The Sprint Black Glass Award is a high quality 5mm thick glass award with black glass centre and a clear surround. Available in 3 sizes, this premium glass award is an oval shaped glass, with flat bottom, supported by a narrow silver pin stand. The centre of the Sprint Black Glass Award is a golden wreath with optional logo insert and a golden engraved text plate.